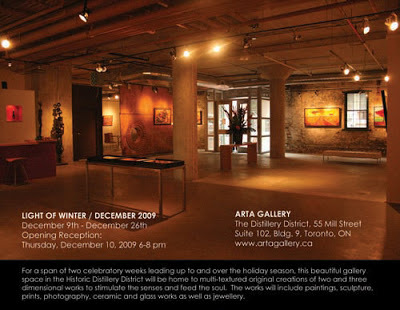 I’m participating in the Light of Winter Exhibition at Arta Gallery at the Distillery District in Toronto. The show opens today. For a span of two celebratory weeks leading up to and over the holiday season, this beautiful gallery space in the Historic Distillery District will be home to multi-textured original creations of two and three dimensional works to stimulate the senses and feed the soul. The works will include paintings, sculpture, prints, photography, ceramic and glass works as well as jewellery.